When 'We Were Soldiers' was released on HD DVD last summer, it was hot on the heels of Mel Gibson's infamous Malibu DUI bust. More than just "bad PR," the incident cast serious doubts on Gibson's standing in the industry, and the long-term effects it might have on his career. And while the respectable box office performance for 'Apocalypto' proved that audiences were willing to accept the troubled star back as a director, I have to say that while watching Gibson in his starring role in 'We Were Soldiers' again -- this time on Blu-ray -- it's remains difficult to not be reminded of his recent offscreen antics. Based on the acclaimed "We Were Soldiers Once... and Young" by Harold G. Moore, 'We Were Soldiers' depicts the bloody conflict that would come to be known as The Battle of the Valley of Death, named for a small landing zone in Vietnam. Mel Gibson stars as Lt. Colonel Hal Moore, who must lead a battalion of 400 ethnically and culturally diverse young soldiers -- fathers, husbands, brothers, and sons, all troopers from an elite American combat division -- in an attack against what would eventually total 4,000 North Vietnamese soldiers. The ensuing massacre lasted 56 hours, and remains one of the most savage in U.S. history. 'We Were Soldiers' attempts to pay tribute to the nobility of those men under fire, their common acts of uncommon valor, loyalty to their country, and love for those they left behind back home. As I wrote in my review of 'Jarhead,' there are generally two types of American war movies -- those that attempt to confront, deconstruct or challenge our most-cherished beliefs about what war means, and then those that pay tribute to the heroism, courage and nobility of the men and women who have served and died for our country. I suppose I could also draw other lines between the two types -- liberal/conservative, blue state/red state -- but I won't even go there. (And like Kinsey's scale of sexuality, of course there are war movies that fall all over the spectrum.) Instead, I'll just say that 'We Were Soldiers' doesn't really cover any new ground either way. It is as heartfelt, well-meaning and as brutal as any modern war movie, yet doesn't seem to have much of a point of view other than that soldiers are heroes, their families suffer greatly back home, and despite war being hell, it is nevertheless a noble, necessary enterprise to maintain democracy. Depending on where you sit politically, these could be ideals worth dying for or very troubling moral quagmires. Despite my own more left-leaning sensibilities, I was never "offended" by 'We Were Soldiers' so much as I was bored by it, because it didn't aspire to be anything more than average. After such genre-redefining landmarks as 'Saving Private Ryan,' 'Platoon,' 'Apocalypse Now' and 'The Deer Hunter,' any war film had better have something new to say or be dismissed as irrelevant. I know that probably sounds like a terrible thing to say about a film as earnest as 'We Were Soldiers,' but it is hard to find much to applaud in a film that offers so little that we haven't seen before. Perhaps most disappointing is that the film's characters are all caricatures. The expositional drama of the soldiers' home lives is reduced to little more than a few short scenes of domestic bliss before the inevitable carnage begins. We learn little about Moore other than that he is a near-saint who is always ready with a noble platitude when needed. In turn, none of his charges are fleshed out in great detail (which is too bad, as there are some fine actors here including Greg Kinnear, Chris Klein, Dylan Baker and Clark Gregg, all wasted). Even when the film eventually returns to the suffering wives back home, the device feels manipulative and conventional, shedding little light on what the men are going through during battle. It's just too predictable to be genuinely affecting. The film's war scenes, too, are formulaic. Though certainly as visceral and bloody as any ever seen on the big screen, there just isn't any underlying story thread on which to hang them. They even start to feel pornographic after awhile, with the bloodshed rubbed in our faces to such a degree that it stops underlining the sacrifices and heroism of the soldiers and instead becomes exploitative. This is in stark contrast to a 'Saving Private Ryan,' where the battle scenes were much better integrated into the film's narrative and propelled the story forward instead of stopping it dead cold. Add to the mix a rah-rah score that telegraphs every emotion, and I really started to feel badgered by all the emotional button-pushing. 'We Were Soldiers' has all the subtlety of a sledgehammer. Ultimately, maybe my expectations were just misplaced for 'We Were Soldiers.' I like to be challenged by movies, and to see something I haven't seen before, especially with a genre film. Critically, I don't care if a film is made with a sensibility 180-degrees opposite of my own beliefs. But there is nothing more dispiriting than a film that takes subject matter as important as this and manages to turn it into such an inoffensive, bland, unmemorable experience. For me, 'We Were Soldiers' was just far too routine. 'We Were Soldiers' arrives concurrently with another what-took-you-so-long-to-hit-Blu-ray release, 'The Manchurian Candidate.' Like 'Candidate,' 'Soldiers' is also presented in 1080p/MPEG-2 video, versus the VC-1 encode used on the HD DVD version. Also like 'Candidate,' despite codec differences, both versions are indistinguishable and are very fine efforts from Paramount. Of course, it probably helps that Paramount opted to hold off on releasing 'Soldiers' until BD-50 dual-layer technology was available, which gives this one a healthy bitrate even with the inclusion of a considerable number of extras. 'We Were Soldiers' as a film has a somewhat incongruent visual style -- impeccably mounted and extremely polished, yet slightly gritty with a thin veneer of grain adding a little bit of "realism" to the proceedings. The result is that many portions of the film look fabulous, while some look a bit softer and dirtier than others. However, this is no 'Saving Private Ryan,' with its bleached-out colors and distressed film stock. Overall, the source print used for 'We Were Soldiers' looks great, with solid blacks and terrific contrast. Colors are very well saturated, with the sunny exterior scenes flush with rich oranges, reds and greens and nighttime sequences boasting deep blues and purples. Also impressive is the lack of noise or pixelization, which gives the film a very smooth and clean look. However, in some cases this transfer suffered from a softer-looking image than I'm used to on either Blu-ray or HD DVD. The non-combat sequences especially lack depth -- at times they look more like standard-def than high-def. But all of the Vietnam scenes look pretty darn great, with a nice sense of detail and strong shadow delineation even in the darkest scenes. This one also didn't seem to carry any of the "hardness" of the earliest MPEG-2 transfers. Whether encoding technology is improving or the technicians who author these things are just getting more adept, I don't know, but I'm really happy with the results. 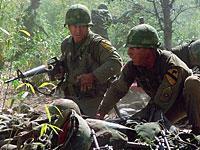 If you can get past the spotty non-Vietnam sequences, 'We Were Soldiers' impresses. As good as transfer is, the audio is even better. 'We Were Soldiers' really delivers an immersive sonic experience that rivals the best war film soundtracks ever put on disc. Paramount also includes Dolby Digital Surround EX and DTS 5.1 surround tracks, the former encoded at a full 1.5mbps and definitely the preferred mix. Bested perhaps only 'Black Hawk Down,' 'We Were Soldiers' delivers some of the loudest and most aggressive war action I've ever heard on Blu-ray. Gunfire and explosions circle the entire 360-degree soundfield, and imaging is stunning. There were moments I wanted to crouch underneath my couch as the sense of presence and depth was so striking. Certainly boosting effectiveness is the extra matrixed-in surround channel, which increases transparency and the seamlessness of directional effects. Dynamic range is also reference-quality, with even the most subtle discrete sound effects feeling absolutely real. Just as stunning is the .1 LFE, which delivers intense vibrations that can move furniture if you play it loud enough. I was also impressed by how well-balanced dialogue is amid such a bombastic soundtrack -- I expected plenty of volume-adjusting throughout, but even quiet scenes were always discernible. Truly superb. Paramount has ported over all the extras from the standard DVD release of 'We Were Soldiers' to both high-def formats, although they weren't all that thrilling the first time out. Still, it is a nice package of goodies, especially the making-of featurette which is the stand-out of the bunch. First, though, there is a screen-specific audio commentary with director Randall Wallace. Unfortunately, though he's engaging and informative for about the first half of the film, he eventually starts to drift off into silence during hour two. Much of the track finds him other simply rephrasing what is on the screen, or watching the movie along with us. That aside, he shares some good production anecdotes, has fond words for his cast, and provides some intriguing insight into which characters and situations had to be removed or altered from the source book. Overall, a fairly good track. Next up is the 29-minute "Getting it Right: Behind the Scenes of 'We Were Soldiers.'" This is an above-average EPK featurette, and includes plenty of making-of material and on-set interviews with Wallace, Mel Gibson and assorted cast members. But the real boon are the interviews with Lt. Hal Moore, as well as many of the real-life wives depicted in the film. They offer a genuine and poignant commentary on the movie's intended realism, and I only wished this was longer. And while the quality of some of this material is spotty (especially Gibson's poorly-recorded interview) the strength of the story shines through. 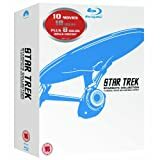 The last of the major extras is a collection of 10 Deleted Scenes. All are presented in fairly rough 480i video, and include optional commentary with Wallace. These scenes offer an interesting angle on the film's somewhat split personality -- I felt that the story of the wives sometimes seemed at odds in the movie with the Vietnam sequences, and nearly all of the cut material involves the soldiers. It would be interesting to see a longer cut of the movie with most of these scenes reinserted, as it might go a long way towards fleshing out some of the movie's wafer-thin characters. Rounding out the package is the film's theatrical trailer, presented in full 1080p video. I can't say I was a particularly big fan of 'We Were Soldiers.' I felt it offered little new to the war genre, and pales in comparison to such seminal films as 'Saving Private Ryan,' 'Apocalypse Now' and 'The Deer Hunter.' But this Blu-ray release is certainly first-rate, with a strong transfer and even better soundtrack. The extras are healthy, too, so the all-around value of this package is high. If you're a fan of the film, this is definitely worth considering for purchase.